﻿Dr. Michelle Kelley ﻿grew up on a farm in Idaho. She moved to California to attend college and received her B.S. in Zoology from the College of Agriculture UC Davis. She graduated from UC Davis Veterinary School in 1994. She has worked with a broad range of species and has a special interest in surgery as well as the use of technology in the advancement of veterinary medicine. She has also been involved in the use of technology for children with various learning styles. Dr. Kelley is the mother of 2 teenagers, 3 cats [Charlee, Lucie and O’Malley] and Wilford, her rat terrier mix. 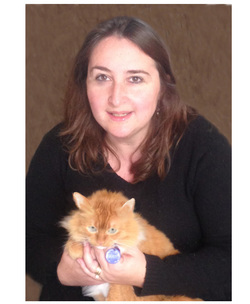 Dr. Li﻿nda Hall has been practicing veterinary medicine for just over 20 yea﻿rs, most of it in the Bay Area with some emphasis in felines. She is a 1994 graduate from U.C. Davis Veterinary School. Having grown up in Spain, she is a native Spanish speaker. As a Burlingame resident with two children, she has been very involved in the community. Other members of her family include her dogs Lunni and DJ as well her cat Chicken Juice. You may have seen Lunni in the Burlingame Pet Parade or at the soccer/baseball fields. All three, but particularly Lunni and DJ, had some challenges from birth but have overcome them and we are super fortunate to have them in our lives.